1. Pour vinegar into a sauce pot and heat over the stove for 5 mins(low heat). 2. Turn off the heat and leave it to cool. 3. Add flowers into it and pour into the bottle and seal with a cork. 4. Leave it to stand for 3 weeks in a warm and bright place. 5. Use the vinegar as according to each recipe. 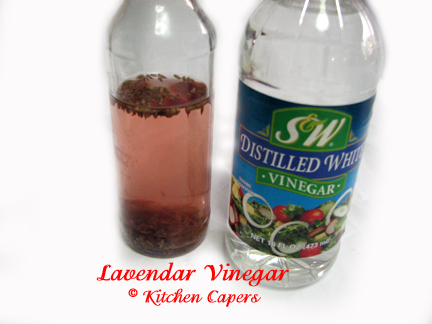 The vinegar will turn into a light purple tint. It should smell of sweet lavendar fragrance. No need to freeze. Can be kept outside the fridge, away from direct heat. Store in a dry, cool place. This is great for marinating Beef, Lamb.